South-side space-pop duo Midstates and the Choir of Ghosts will soon release a new record called Morning Pacific, and they're offering Windy City Rock readers a taste with a free download of the first single, "Hate to See You Smile." 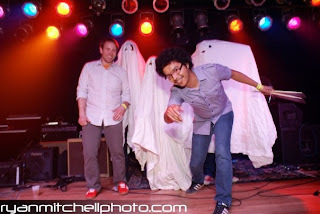 Originally known simply as Midstates, the "Choir of Ghosts" was recently added after founder and guitarist/vocalist Paul Heintz began working with drummer Jose Rodriguez following the departure of co-founder Steve Munoz. In its previous life, Midstates released the records Shadowing Ghosts (2003) and Boxing Twilight (2006), which brought in rave reviews from the likes of Allmusic.com and Jim DeRogatis of the Chicago Sun-Times. The band's sound is self-described as "a fusion of electronic space-pop and psychedelic rock," and Morning Pacific promises to be well worth checking out of its first single is any indication of what to expect. Keep an eye on the duo's Facebook page to stay up to date on information about the record's release and any upcoming shows, and check out their official site for more free downloads. UPDATE 8/26: Midstates and the Choir of Ghosts have a FREE show coming up this Saturday, August 29 at Darkroom. American Princes and Driftless Pony Club will also play. 7 p.m., 21 and over. Click here for more info.